Do you ever forget about a recipe, then run across it, or find something that reminds you of it and you think, “I love that and had forgotten about it. I must make it NOW!” Well, that’s what happened to The Goddess last night. You know, you would think that a Goddess could get these damn boxes and all this crap, eh, I mean treasures, sorted through and packed up faster than this, wouldn’t you? Well, apparently not! Anyway, she was going through a stack of papers, I kid you not, when I tell they had been sitting on that shelf for at least 5 years…it’s embarrassing to admit that. Normal people don’t do such crazy things. Anyway, there was this recipe for cabbage soup. Not the one I’m going to give you today, but it made me remember this one. I love this soup. I want this soup. I need this soup. This is a brothy, tomato-y, chunky, vegetable-packed soup. You’ll note the recipe mentions ground beef as an ingredient. It can have either ground beef, beef short ribs, pork or beans (legume-type beans) in it. I left it out, because there’s something about the purity of using only vegetables, that I adore. The bonus—it’s very low in calories, it’s filling, and it’s loaded with fiber and of course, the most important thing…it tastes fantastic! It has a bit of sweet, balanced by sour, and it’s flexible. I believe this could actually be what the Russians refer to as borscht. I don’t think Russians necessarily use beets in their version of borscht. Does anyone know about that? This could also have it’s roots in the Jewish community, because of the use of the citric acid or sour salt, though obviously, they wouldn’t use pork. As you know, I’m cleaning things out, so I got rid of a couple of cans of tomatoes, some broth, dried mushrooms, and some carrots that were beginning to sprout tops! You all know you’ve had that happen, you are just smart enough not to admit it! So here’s the recipe, but I altered a few things…. Crumble the ground beef into a large pot. Brown, breaking the meat up, over medium heat. Add the remaining ingredients, except the garlic and cabbage, and 1 quart of water; bring to a boil. 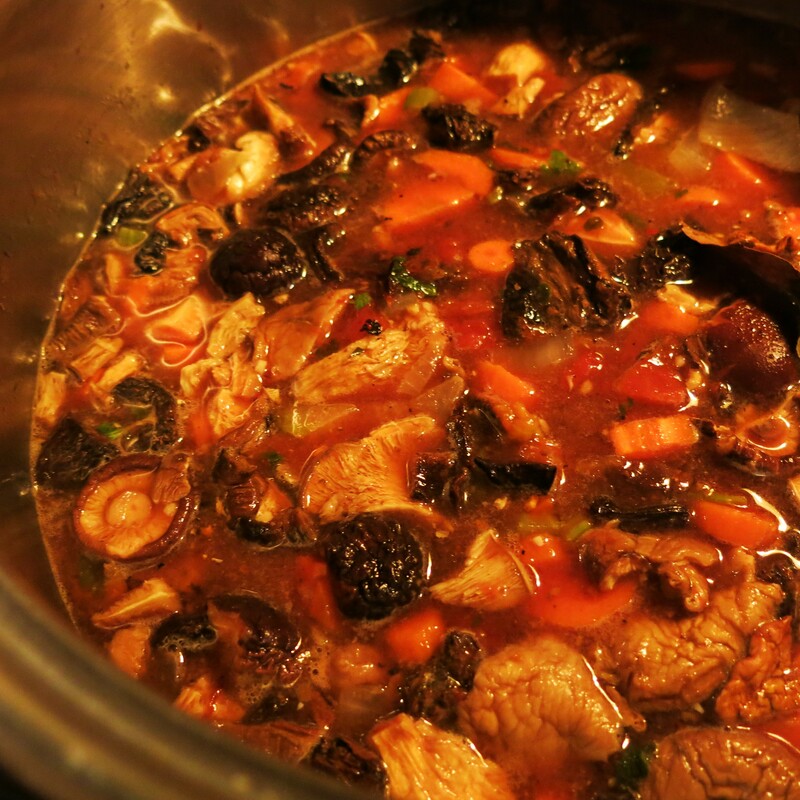 Once the soup comes to a boil, lower the heat, cover and simmer for 15 minutes, stirring occasionally. Pour in one more quart of water, and return to a slow boil. Add garlic and cabbage. Lower the heat and simmer for 35-45 minutes, until the cabbage is just tender. Add the citric acid, taste and adjust the sweet and/or salt as needed. Cool slightly, then ladle into soup bowls to serve. You can serve this with a garnish of sour cream and fresh dillweed, a sprinkle of parsley or just as it is with a slice of day-old bread in the bottom of the bowl. NOTE: You may omit the ground beef and add cooked legumes, like chick peas, kidney or pinto beans. You may add 1 cup of any of the following, with the cabbage: coarsely chopped green beans, corn kernels, diced zucchini, very thinly sliced fresh fennel bulb, sliced celery, etc. It will be good, no matter what. This reheats beautifully and gets better each time you reheat it! 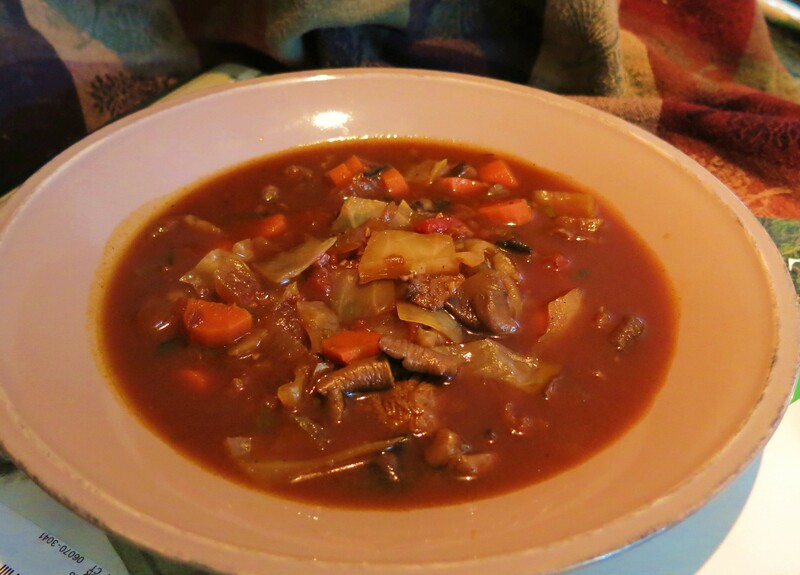 Sweet & Sour Russian Cabbage Soup Recipe©Marcia Lahens 2015. All rights reserved. See…it’s pretty easy. It takes much more time to chop everything up and you can just really hack things up; just keep things bite-sized. I used sun-dried tomatoes, because I didn’t have prunes. But, do make this with the prunes. They just sort of melt and become one with the soup…very Zen-like. I used both frozen apple juice concentrate and some maple syrup. You have to taste this at the end, then add the citric acid and adjust the sweetness and add salt, if needed. You can also add a couple of teaspoons of caraway seeds and some pearled barley, if you want to go that route, which is delicious, as well. 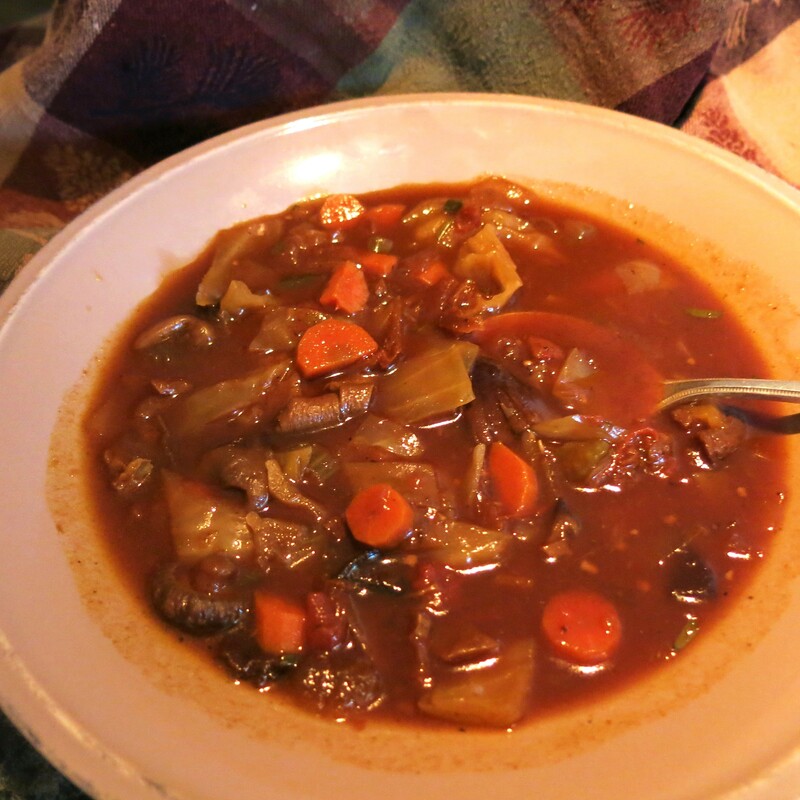 I used some beef soup base paste, but you could use a vegetable or mirepoix base if you want to go the truly vegetarian route. You can get those bases at The Spice Mill and I would advise you to get some. You won’t be sorry. They have all different kinds there and they are terrific to have in your fridge or freezer. You’ll never buy canned broth again. The Goddess didn’t get this started until evening, and it takes awhile, because you want this to cook low and slow. So she was enjoying a hot-out-of-the-pot mug in the very wee hours of the morning, leaning up against the counter, slurping this elixir. This is a slurping-type of soup! She will be happily enjoying this all week…for breakfast, lunch and maybe even dinner! She’s crazy like that.